This is Austria's commemorative of the first silver Thaler (Taler) struck at the Hall mint in 1486. I'm collecting the restrikes of this very famous and iconic coin because an authentic coin is very expensive and rare. One of the few I've seen for sale sold for over $12k. The restrikes began in 1953 and several types are available here in the Museum. 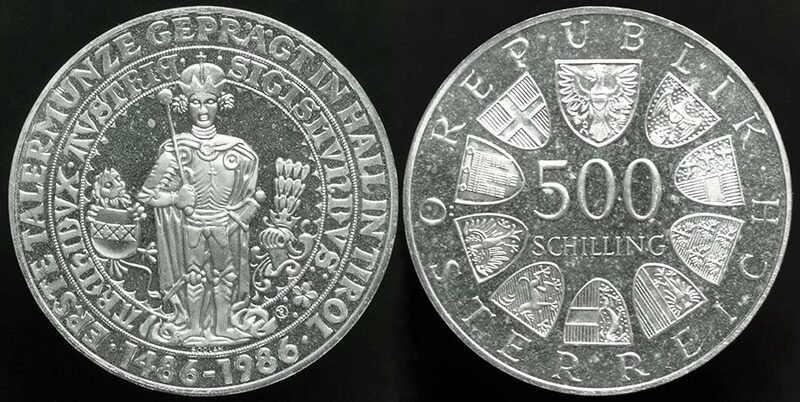 The year 1986 was the 500th year and it was struck appropriately on a silver 500 Schilling coin. In hand you do not see these 'proof' impairments, so this needs to be photographed again with a different light. Obviously something is there so this may be an example of what KM calls a 'special Unc' strike. Mintages: Unc = nearly 360k. ; special Unc = 41.2 k; and proof = 99k. Condition: Proof or what KM calls "special Unc"